This is such a simple recipe that I never thought to share it on this blog. It is so ordinary for me I guess I take it for granted. So, inspired by the enthusiasm this humble little recipe received from fellow blogger, Dan from Essex Eating, I thought I should share. 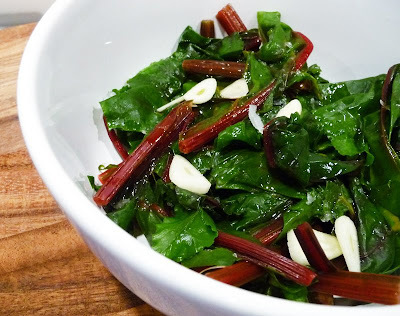 After pasta, which in the old parts they still eat every day, the Italians like to serve up a dish with some form of greens that have been blanched and dressed. Most country folk still grow their own, so a big bag of cabbage, spring greens, radicchio or spinach will turn up just as dinner is being prepared. I can only imagine the simplicity of this dish came from having to cook these field-fresh veg quickly and simply, whilst the pasta was on the boil. Sometimes they are eaten with grilled meat, but often it they are served on their own, with some lovely chewy bread to mop up the infused oil. There is always a bread war in my family for the mopping up bit! As I received an Abel & Cole organic veg box this week, I decided to use the cabbage and the tops from the beetroot (waste not, want not) to explain this recipe and its variations. 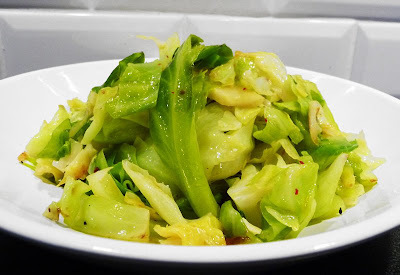 My favourite version is using spring greens with the chilli, but it really is perfect for any leafy green and really good to add flavour to cauliflower or broccoli (especially the Romanesco kind). If the leaves have tougher stalks, for example the red stalks of the beet tops, I blanch or steam these first then follow with the leaves after a few moments to avoid the leaves wilting too much. I like this version for the tougher, greener leaves like cabbages and for spring greens. Blanch or steam the leaves until they are tender. Drain them very well. In a large pan, heat a really good glug of olive oil (remember the more you put, the more you can mop up!) with a couple of cloves of garlic and as much chilli, fresh or dried, as you prefer. Add the drained vegetables and toss them through the heated oil for a few minutes, evaporating any water. Season with a slightly heavy handed pinch of sea salt. Let it cool a little before devouring! This is used for the younger or lighter leaves like radicchio, beet tops and spinach and for cauliflower and broccoli. Blanch the veg until tender but firm. Leave them to cool a bit but whilst they are still warm dress them with olive oil, thinly sliced garlic, freshly squeezed lemon juice and sea salt. You can eat them still warm or let them go cold. These can be served as they are intended after some pasta, or served with a lovely creamy buffalo mozzarella, or even as part of an antipasto plate. But always, always with a slice of good, hard and chewy bread.